I frequently talk about the importance of a well-tuned nervous system to activate and stimulate your muscle fibers. Indeed, the neural processes involved in muscle contraction start in your brain, travel down your spinal cord, and feed information to the motor neuron that’s attached to your muscles. However, today I’m going to focus on the muscle fibers themselves. After all, your ability to generate maximal power depends on the contractile capacity of the muscles. 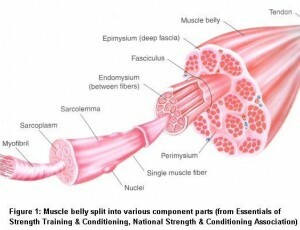 Of particular importance is the muscle fiber type. Not all fibers are created equal. There are three primary muscle fiber types: type I, type IIa, and type IIb. Type I fibers have low force-producing capabilities and high endurance characteristics. When you run a marathon it primarily stimulates your type I fibers. Next up are the type IIa fibers. These muscle fibers have higher force-producing capabilities with moderate levels of endurance. They’re primarily stimulated with exercises that last around five minutes, although this number can vary greatly. Many exercises that last up to 10 minutes target the type IIa fibers. At the top of the food chain are the type IIb fibers. These are your biggest, strongest fibers that are only activated during high force exercises that last less than a minute. You’ve probably heard the terms “slow twitch” and “fast twitch” when describing muscles. Type I are considered slow twitch while type IIa and IIb are fast twitch. What the heck is a twitch, anyway? In the lab, muscle scientists like to study the rate at which the contractile components of muscle (actin and myosin) can split the ATP enzyme, ATPase. Type II muscle fibers split ATPase approximately 600 times/second vs. around 300 times/second for type I fibers. In a nutshell, type II fibers contract faster than type I fibers do. This is nothing more than microscopic muscle science that probably isn’t important to you. Nevertheless, that’s how those terms came about. One thing that’s clear is that strength-power athletes have a greater proportion of type II fibers than endurance athletes have (Costill et al 1976, Gollnick et al 1972). You probably already know if you have a dominance of either fiber type. If you find that you can perform a lot more reps than your buddy with a given load; or if you favor long, slow runs over short sprints, you’re probably type I dominant. On the other hand, if you consider any set over six reps to be “endurance training,” or if you find that you can only crank out two extra reps after decreasing a load by 30%, you’re probably a type II guy (or gal). So at this point a logical question pops up: Can you shift your muscle fiber type? In graduate school my thesis was on the muscle fiber alterations that occur between strength and endurance training. As a gross generalization, the body favors transitions toward more endurance characteristics. You can transform type IIa fibers into type I fibers. And you can decrease your type IIb pool to favor more type IIa fibers. Only a couple of studies have shown that you can increase your proportion of type IIb fibers (this, not surprisingly, was shown with high-intensity, short-duration sprint training). But if you’re looking to develop a more muscular body, don’t let a lack of type IIb muscle fibers discourage you. There’s another fiber type that can get bigger, stronger and possess enough endurance to knock out your competition. To learn more about this special fiber type, and ways to build it to transform your body, just CLICK HERE. I was just wondering if this “new” fiber type I’ve heard of recently was something magical or if there was some scientific evidence to support this theory. CW: The fiber type in question is often referred as type IIx or type IId in research. thanks chad i realy appreciate this.